Yes, I was asked to leave the polling area because of my t-shirt. It had a portrait of Obama, but no words!!! That ain't right, but I didn't want to go to jail before I had a cup of free coffee from Starbucks. I reluctantly agreed to leave instead of having to turn my shirt inside-out. What if the only clothes I had were Obama clothes, provided by the government, with prints inside and outside? Would I have to Vote Naked??? Plus, why is a photo, without text, considered propaganda. I took an "I Voted" sticker and drove to Starbucks and got a cup of Joe. 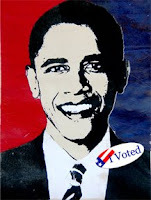 After that I went back to the polls and wore a Dickies jacket over my Obama shirt in order to be able to cast my vote. I had a flood in my shop last week. For some reason I had woke up at 2am and actually headed to work at 3am. I never do this, but I was drawn to the disaster that was going on. I opened the door and water was 1" deep in the shop and spraying from a nozzel that had broke in the night. I grabbed what I could find, t-shirts, and threw them on the floor. By 5a.m I had done enough to where I could leave and go back to bed hoping somehow that maybe the entire fiasco was a bad dream. It wasn't, but even though the damage was limited I am most impressed that I somehow got up in the middle of the night and found this mess before it got any worse. I am working on installing a wholesale t-shirt wiki at WikiTshirt.com I plan to use the site as a more definitive place to develop descriptions of all of the different aspects of screen printing and t-shirts. This blog works good, but the organization is linear by date and I need a place to organize the information I need for my customers by subject. Just text editing on a blog is tough, but limited information edited over time should provide useful tips that will be helpful for hundreds of years. Once it is up and running I'll start pasting some of the information about shirts from here on the wiki. I also need to block the spammers from this wiki. This is the only reason the t-shirt wiki has been postponed. Everytime I start a bulletin board / forum it gets overrun by spammers. the same thing happened as soon as I started a wiki on toptennewstories.com Then I went to upgrade to a more recent wiki from wikimedia.org and I needed php 5.0 to run the database. This required me to try a new server for the database to work on, so I am trying a new company that hopefully has the php5.0 built in to thier database servers. La, La, La. I can only say that if you think screen printing is tricky, you should try networking and running a database. It makes screenprinting fun. I don't remember if I mentioned this the other day, but I am working on a list of categorized characteristics for the various brands and styles of shirts that are commonly available for wholesale t-shirt printing jobs, hoodies too. There is a wide range of styles for t-shirts, some of which are organic t-shirts, some are ringspun, not printable, cheap, expensive and so on... Well I am going to try an summarize these items for a sort of cheat sheet for people to quickly figure out which type / brand of tshirt they are looking for. A briefing of this list can be found here: Wholesale T-shirts Brand List - work in progress. yes, i was going to save the world. 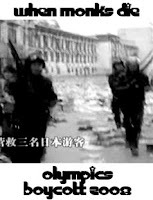 My co-worker, Aaron, sent me a PDF of photos with sympathetic sayings about the use of plastic bags and the effects on the environmen. After viewing it I realized that there is no reason to be using said bags in our store since number one, we can print on inexpensive canvas bags and practically give them away for free while advertising simultaneously, duh. Who needs a number two, duh. Ok, I have a number two, its, uh, number two...oh, yeah, paper bags, yes, paper is fine since wood is divine. I rymed, oh yeah. All things break down, but paper breaks down quicker, which makes bags superior. Earlier today I had to cut my entire shower curtain section after hearing that the release of phalaytes from opening a shower curtain is dangerous, hazard to your health. I will admit, those things stink after you open them. Now I'm on a search for an organic shower curtain that won't kill me while bathing. Rayon, Bamboo, Hemp? You would need a very strong rod to be able to sustain a cotton shower curtain. It would need to be water-resistant, flexible and light, like a force-field against water. That's all there is my friend, cotton fiber. Let's throw out the dye and rip them all, if that's all, there is. When I was a young boy I used to fish at the pond by the mill and one day when daddy caught an bright orange fish and said, it's the from "The Mill". I thought to myself is that all there is to mutation? Then one day I was standing around a boat listening to racist talk about things that happened over 100 years ago from three-fingered people when I asked, "what happend to your hand?". The old man called Whitey (because of the lint in his head) said, "The Mill". I though to myself is that all there is to a hand? Then one day I was at a party for 4th of July that was put on by "The Mill" and since I went to the Mill school and lived in "The Mill" house on "The Mill" street I was able to attend. They had some of the best free hot dogs and the people that worked at "The Mill" got two weeks vacation. It was a lot of fun, but I couldn't help but wonder if they should've have to lose their hands, catch glowing fish and eat hot dogs for fun. Now I've worked for 20+ years in the cotton pushing business and although I still have all my fingers I can't help but think when people ask me stupid questions about t-shirts and printing on fabric that they shouldn't think it to be that important. It's not all it's cracked up to be to be in the fashion business, because it is still business. That's all it is. Pardon the pun, but I can't help but try and bee punny when writing on this blog. Who could possibly care this much about t-shirts to follow or not take humor in every nook and cranny of life when it comes to t-shirts. The only reason I've been successful at this is I don't care about being serious, otherwise I would've gotten a real job at the local money making factory. My point here is that I have been spending my afternoons drying old t-shirts that I used to soak up water from a flood I had in my new warehouse. Nothing like the floods that people are suffering through in Iowa and along the Mississippi River, but my own little version of a hose breaking and watering the cement. Luckily I woke up at 2a.m. that day and decided to go to work early, otherwise I could've increase the water-level of my the San Francisco Bay by a couple of inches had I shown up on my normal schedule around noon. These shirts are still not worthy of being thrown away where they could decompose quietly. No, I'm planning on drying them out and printing on them again, for test prints and for cleaning out old ink. I just can't let them go. They aren't worth much, but what the hey it would cost more to buy rags than t-shirts, so why not. Plus I like the idea of drying clothes in the wind. I hang them all over my truck and then when I have to go somewhere I remember that they are hanging and I pull them all down quickly and toss them in the back, still damp. Did you know that original photo-chemicals are commonly recognized as being when people dried their clothes in the sun and the light made the colors brighter. Without this type of human-brilliance we never would've had photography. The effect of the sun and air on garments makes them stiffer, but somehow they feel cleaner too. It's as if they fibers got to breath and they are empty of soil that comes from wearing clothes. These shirts aren't exactly clean either, since they have soil caked on them from the ground and from laying in the back of my truck, however, after they have hung for a few hours they seem cleaner, not quite wearable, but cleaner. This is how I think the American people feel. There is nothing funny about it, but it is coincidental that the last time we elected a new Democratic President there was flooding in the summer in the Iowa region. This indicates that the nation may be going through a cleansing of sorts, baptismal-like, rinsing away the misdirected passions of the past so that we may move forward in the fall with a new approach, a new government. I couldn't help but mention this as something that only being old enough to notice would allow someone to consider the similarity of the times. Sure, there are also paralells between the end of the Nixon era and the begining of the Carter term, but I wasn't paying attention to politics and weather then. This is symbolic and as indicative of events as the Presidential polling. I've been using water-based for my t-shirt samples since I don't have to heat up a dryer and for one-color jobs the inks are similar to plastisol inks. For bigger t-shirt printing runs white t-shirts I've been thinning down the black to make it similar to the water-based and have come to find that I like it a bit more than water-based because it doesn't bleed through to the inside of the shirt. Back and forth, that's how this challenge seems to be going. Water-based inks are good for this bad for that and the same goes for plastisol inks. There has been a lot of discussion lately about phalaytes. I wonder how that effects t-shirt inks. Basically if you are concerned about your carbon footprint then I suggest only white or natural shirts since they must have less coloring in them and require less ink to print. I'm looking to buy Organic T-shirts in quantities of 100 at a time to start. I would like them to be shipped to Sydney Australia. The shipping seems to be more than the cost of the product. Yes, the shipping is expensive and not guaranteed internationally. We can estimate your shipping in the cart as you have seen or we can provide an exact quote with an exact address and quantity of shirts. For exact shipping quotes we require orders to be prepaid via wire transfer before processing the order for shipping. Any final adjustments to the shipping cost will be done via credit card. Typically we use the USPS Global Express for international t-shirt orders. Sometimes we have to break the order into several shipments for handling purposes. We cannot track products shipped internationally, but the Global Express service is the most economical, almost trackable service for international shipping. This means we also cannot guarantee international shipping because the final shipment depends on the carriers inside other countries. Shipping internationally is executed at the risk of the customer although there is significant price differences between the dollar and other currencies right now. If you are considering a large purchase, then you may want to get a freight agent who imports to your country in order to process the potential taxes. In this way you can control the shipping cost because we will only have to ship to the local delivery point. For orders over $25,000 USD we can arrange to find an agent or international delivery. I've found to countries like Japan the final cost, including taxes, can be as high as $2/shirt. In the Netherlands it might be higher. I'm not sure about Australia or New Zealand, but we ship to these countries. Hi my name is Casey, I'm enquiring to see if shipping on t-shirts is as expensive as your site says. I'm looking to buy American Apparel Organic T-shirts in quantities of 100 at a time to start. After 7 days of ladder hopping and duct taping I've gotten a reasonable combination of fans and ducts that no longer resembles a scene from the movie Brazil. Grainger has an amazing selection of fans and switches that came in handy. Most of the ducts came from Home Depot. Now I have a small variable speed fan at the exhaust vent of the InfraRed dryer and a suspended 8" vertical exhast fan above the flash unit. This is assisted by a remote vertical exhaust dryer booster that turns on automatically with a pressure sensitive switch. I also picked up a couple of window fans, but I am worried that it may interfere with the venting. Now I can experiment with the discharge inks in a more reasonable way. I've always associated air ventilation with air conditioning and it's never been within my price range, so from a working environment standpoint I feel like I've been freed from the restraints of working with some chemicals. At the very least it will make the shop more bearable when toasting plastisol like burning bread for multi-colored prints. If this works I'll always install an overhead vent from here on out like an overhead vent on a stove, why not? I'm never going back. Update on Phot-Fresco frames: I covered several test Photfrescos with clear exteriors. The idea is to encase them for waterproofing and to protect from the degradation that the inks suffer when exposed to direct sunlight. I realized some of the similarities to t-shirt printing to ink jet printing on paper when researching the inks versus dyes article listed in a previous post. This makes me aware of the archival nature of all products, prints especially. One of my arguments for the Phot-Frescoes is that they are like having a photograph in stone. However, my test have shown that in direct sunlight the inks from the inkjet printers that I use breakdown quickly on the top surface of the plaster and turn to white dust. Not so good for a Rock Photograph. I've tried several sealing methods like brushing on acrylic clear varnish, but it dissolved the prints and smeared the designs. I used spray paint acrylic varnish, but this required too many coats as the spray was absorbed into the plaster like a bisque clay is absorbed into the sides of a mold. Yesterday I tried a clear epoxy, more expensive, on one framed fresco and a polyester resin, less expensive, on another. I poured them in the parking lots of the respective stores where I purchased the materials and let them dry as I drove over the Richmond Bridge to my laboratory. I thought this was good for spreading, ventialating and working out air bubbles in the material. The polyester resin butterfly fresco was yellowed and it dulled the colors of the image. The Epoxy dried clear and increased the vibrancy of the colors. The Epoxy coating was superior for the opacity of the top coat, but it also may have changed the image, making it blurry and glossy. The cleark at the store described this as making the image look wet if it isn't sealed before the epoxy is poured. At a marine store I am investigating a penetrating epoxy which sounds good and I am familiar with this stuff from working on boats. Basically it follows into the pours of wood and seals off the rot and is used to seal a spot before filling and sealing the opening. My goal is to understand the inks that are being fixed with these chemicals is at issue with the Frescos, as well as, with the t-shirts. These last frescos I fixed were made with the cotton dyes that I have been using and the Seaweed paste I have been experimenting with. As the residue dried on the leftover material it turned back into a sea weed like film. This means that the pigments from t-shirt dyes can simply be taken over by the longterm breaking down of the plaster below and simply overwhelm the pignments and turn them to white just like the sun can do as it breaks down the pigments. Possibly a penetrating epoxy may substitute enough of the plaster to create an internal barrier to this decay. Today I am going to make two new phot-frescos with wooden screen printing frames as the base with the images of a Loch Ness Monster passing under the Golden Gate Bridge. Here is the t-shirt version of this modified postcard image of the bridge. 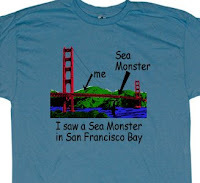 I don't want to go into details, but there is indeed at least one Sea Monster that lives in the cavernouse waters below the inlet to San Francisco and on foggy days it has been spotted following boats that have veered off course. There are two other side project experiments that keep pulling me back in. One is the ,Phot-Fresco or Photo Fresco which bettere describes the transfering of images to plaster. This is mostly an artistic endeavor, but it is fun as it mixes sculpting with imagery in a grafitti-esque way. The other is investigating Photo-voltaic inks and chemicals to find an inexpensive way to screenprint solar panels on a variety of materials. This weekend I've found a way to mix them both. Over the years I've accumulated over one-thousand wooden frames with old designs on them from customers and I've moved these frames from warehouse to warehouse, until they've come to rest in a warehouse on the outskirts of Las Vegas. I call this area the end of the earth. Because of the waste as a result of cleaning out ink in screens I archive these frames and avoid any chemicals and labor associated with disposing the inks down the drain. Also I go through these screens each time I move them and find old images that are interesting or fun to bring back out and print again. Now they are deep in the archive stored safely away like a pop-art library waiting for future generations to discover the silly stuff that we used to print on our clothing. 1) The frames that I have would serve as a holder for the photovoltaic reactive material or base to create a small solar panel. 2) The poured plaster can serve as a non-conductive base for the material and house the wiring safely, like a ceramic light socket. 3) The inside of the frame can then provide a decorative function with the abstract effects of the photfresco inside the frame. Largely this project is an attempt at finding a fun way to use up these frames, but I am serious about finding the photovoltaic inks and or paints that could be used for cheap solar panels and could be screenprinted. I've heard of films for windows and shingles, but as a finished product these things are too expensive still and ineffecient for any large scale use, so unless I can get the raw materials it isn't really affordable to work with these items. The cool thing with the inside of the panels is that each one can be treated like a pixel in a larger image and when they are mounted together they can make a mosaic or simply a random array of images and patterns. I need to do the calculations, but they could even be fitted together in a circular structure by mounting them together around a curve and angling each one in slightly. It would even be simpler to mount the frames on plywood and position them in a more traditional structure, but the crevices between each frame would need to be sealed like a deck on a boat to keep moisture and dirt from building up under and between the frames. The previously mixed batches of the Seaweed Paste with Fiber Reactive Dyes were still malable after a week of sitting in open containers. I did a couple of test prints with the black dye paste on light colored t-shirts and it moved through the screen reasonably well. Afterwards I had to do cleanup the squeegee and screen with water spray in a sink I am back where I started 15 years ago with waste products. Since the dye has been suspended in water for several days it must be Spent from a chemical standpoint and therefore is not in a toxic format. This makes it similar too the acrylic water based t-shirt inks. The dye is no longer technically a dye because it's active ingredients are spent and therefore the paste isn't dying the tee shirt any longer, but staining the shirt. The residue of the sea weed paste may dilute differently than a water-based tshirt ink, but that still depends on the pigments. If dilution allows the ink residues to pass into the water system then the ink dye is plausable, as well as, the water-based acrylics from that standpoint. This only works on white or light garments and unless there is sufficient drying some of the left-over, but spent inks will either stain the t shirts or wash out and dull the color. Dark t-shirts are a different issue altogether and most likely require the discharge type inks or a bleach paste to clear the color of the t-shirt while printing. I once tried to join the union, any union, all the unions. If it wasn't for the pre-qualification that you had to learn a trade I was going to join them all. I wanted a carpenters card, a truckers card, a metal-workers card, why not? Then when someone asked it I was in the union I could say, "Which One?". Or I could whip out my cards and say, "I got your Union right here buddy!" Now that I get request for every type of t-shirt on earth I've had to make sure we have a Union-made t-shirt. For political purposes Union companies can only buy from Union made shops and many of the political and governmental organizations can only buy Union products. Most of the time they don't want to pay the additional price, just like with Organic products, but I feel like we should make the Union Made USA t-shirts that we carry known here. I ordered some organic??? well, bamboo t-shirts from a company called Onno. There was no white in stock, but I ordered a selection of colors and sizes for what they had. I'll test printing on them and see if the customers in the retail store in LA like them. Even at the wholesale prices they are very expensive, so my expectations are high and my wallet is flat. Seaweed ink base update: In my quest to find or make a real drain-safe ink I have been testing a seaweed past I mixed. After approx 5 days the mixture has finally dried beyond use. This was in an unsealed jar, so that is quite a long pot-life for a non-plastisol mixture. Regular water-based inks won't last that long in a gel state without covering over and being unusable. Discharge: The discharge ink t-shirts I printed and washed are impressive, but it required several extra days to complete an otherwise immediate task. This would add a minimum of $1/ea shirt for the washing process in my view, even at large quantities and that does not take into account the printing with water-based ink cost. Ok, I've gotten enough request that I have started to seriously look for a bamboo shirt to provide wholesale. There seems to be a few companies out there, but the prices are significantly higher than regular cotton t-shirts. I know the fabric is available as a hybrid bamboo cotton mix, but I haven't had time to play with it yet. Cotton is getting a bad name as if it has done something wrong other than provide affordable clothing to the masses, cause slavery and pollute the world due to the chemicals used in growing the cotton. Bamboo has a reputation of being nice, softer and is renewable. At this point softness seems to be a stronger marketing force, regardless of how either product is made. I keep getting request for "soft vintage environmentally friendly inks" as if the softness makes it environmentally friendly. I still think it is the wolf in sheeps clothing from my experiments, however, the final result of discharged ink with water-based printing feels better and I would love to think that it was better for the environment regardless of the truth. Sometimes I think I am the one living in a delusional world, but I have to work with and handle the production with the types of products that I am discussing here. When I offer organic t-shirts and water-based printing services to the customer and explain the price differences of organic t-shirts or water-based inks then they want them, but at the same price as the cheaper readily available plastisol based products. I explain that the inventory is spotty, at best, for these items and then the customer doesn't understand why I don't have all the shirts that they ordered. I love this latest request, after giving a price quote for the water-based ink printing the customer asked if I had one just like that only at the price of the plastisol. I try to restrain from being obnoxious, but I don't see the point of giving an estimate if the customer isn't going understand it. Today someone didn't understand why I can't do holographic foil all over a t-shirt since it may be available somewhere in the world. I said, yes, I can do that, but do you want to pay me $100 a shirt? I understand the customers want these things that are possible, but not readily available or cheap. I want the bamboo shirts for the same price as the regular t-shirts. I want the soft shirts for the same price as the rough shirts. I want the stylish cuts for the same price as the boxy cuts. I want plastisol to be soft. I want to print on darks without having to use discharge and without having to print a white underbase. I want holographic clothing from the 99 cents store and I want the 99 cents store to sell only organic holographic foods. Gimme, gimme, gimme, ...Gimme some more. Gimme, gimme, gimme, don't ask what for. I know the world's got problems, I got problems of my own. Not the kind that can't be solved with an atom bomb. Germs / Black Flag??? Fashion conciousness is not going to save the world, but it can make a difference if we truly understand what we are doing to make a difference. I don't know how bamboo is grown and although it may be grown without chemicals how is that different than organic cotton and why is it better? I understand that bamboo may be softer, like rayon, but that is a style decision, not an environmental decision. It makes me wonder how they can make it soft. I'll do the research, but 9 times out of 10 my research conflicts with what is common knowledge and what people want these products to be. I'll sell these products too and figure out how to print on them, but unless we are willing to pay the price for some of these products now to have this stuff made then it won't happen or be available cheaper on a larger scale later on. I want to provide this stuff and affordability is my goal within the reality of the manufacturing restraints and availability of products that exist. Organic T-shirt update: The organic shirts from Alstyle proved to be an affordable alternative, but because of the rough cotton and stiffness the sales in our retail store aren't positive. The organic tag has not made a difference when compared to softness, which means the American Apparel organic shirts are the organic shirt of choice, albeit their prices are higher. Bamboo research here: Soon to come. I've gotten some feedback that bamboo prints differently than cotton, more like rayon. Let's see? I constantly look for new locations online, mostly through Craigslist, and the market is still crazy after all these years. It seems to me that Landlords are spoiled, especially commercial ones, and they expect a company to sign off multiple years at exhorbant rates in order to guarantee a fat commission for the agent and allow the owner of the property to go on an indefinite vacation. Unless a business can remain profitable, and rent is the largest expense with the exception of labor, then it doesn't seem rationale to have such high rents. Deep pocket companies can afford rents on the basis that they are branding and a storefront could be considered an advertisement that may in the end pay for itself. In fact malls and such will do everything they can to get in a store that will draw traffic while simultaneously jacking up the rent on paper for the other customers. For example, many of the cost of establishing a lease may be covered by the landlord for a larger tenant and the rent on paper appears higher than it really is. Then the market value of the property to a new tenant or to a bank is greater than the actual cost. Based on the current marketing conditions and rental values for properties we will only be able to consider a new location if it fits the budget and/or the landlord is willing to offer complimentary terms. The benefit for the consumer is that more and more business will naturally flow to the web where the overhead cost are less and the savings are passed on to the customers. Once the market changes and there are more "For Lease" signs on the streets, then we may be able to expand further. Ok. Do you require deposit? Couple more things, can you use water based ink on the design, so to give it a softer feel & a vintage look? Also, how do we view the first design before proceed with the rest? Answer: Yes, we require a desposit which usually covers any setup cost and the cost of the shirts for the order. Water-based ink printing would be double the print cost or $3.50/ea for the printing part of the order for a 2-color job. After we receive a deposit then we will proceed with processing the artwork and making a sample. The sample generally takes 3-4days. We would either mail you the sample or send you a photo jpeg of the actual shirt. For water-based inks we prefer that you approve the actual sample. To get the order started you can call in the card number for the deposit to Brandon at 323-664-0021 after 10am. Mon - Friday. Let me know if you want to proceed and I will write up the order. Question: Attached is a logo that we would like to use for our t-shirts. We're going to be supplying our own 250 shirts. The logo will be 3 x 4 inches and we'd like it to be located in the back center upper part of the shirt, and in the front part we'd like a solid one color word: BREATHE that should be 1 1/2 inches tall. Answer: Typically we don't print on provided shirts, but if we decide to take the job then all setup cost for screens will be charged at $30/ea and we don't bear any responsibility for mistakes in the printing, loss or damage to the shirts in printing. From the artwork it is hard to tell exactly how many colors are in your design which makes it difficult to give you a quote. The quote would also depend on the color and type/brand of shirts you want. Here is a link to the printing prices to give you an idea of the prices. If the logo is going to be only 3-4 inches across then you shouldn't waste your money printing all of those colors, but should consider re-designing your artwork to make it printable in 1-2 colors. Here are two references that may put the legal ramifications of these inks and dyes into perspective, Proposition 65 and ASTM D-4236. MSDS Sheets to follow. • a product presenting a chronic health hazard comes with safe use instructions." Basically this means that handling instructions are included with the material or are posted on the label. Since the label I am using for discharge inks does not list any ingredients specifically as ASTM D-4236 conformity dictates, then I must conclude that there are no chemicals that present a "chronic health hazard" in this material. Let's hope this is true.
" Proposition 65, the Safe Drinking Water and Toxic Enforcement Act of 1986, was enacted as a ballot initiative in November 1986. The Proposition was intended by its authors to protect California citizens and the State's drinking water sources from chemicals known to cause cancer, birth defects or other reproductive harm, and to inform citizens about exposures to such chemicals." Note: I am thinking of setting up a shop outside in my backyard which would maximize air-flow. Also I want to drain off the excess inks and create a toxic garden where I can allow the inks to filter through dirt/sand chambers and see if grass will grow or if the flowers will bloom in this material. Discharge: With the discharge paste that I have been using it releases ammonia during the process. Since the shirts are being heated to dry I am assuming the ammonia is being diluted in the air as it sets and floats upward until it is cooled and/or dispersed. I can't imagine that t-shirt printing can release excessive amounts of ammonia at any one time except in large automatic printing shops. Other discharge inks may release different chemicals, but I am still not clear about the liquid state of discharge and any leftover discharge ink would be in the garment until washed. Also bleach or a bleach paste may be the simplest least caustic chemical to experiment with next. I've used hydrogen-peroxide in the past to eliminate scorching, so that may have some ability to remove t-shirt dyes from cotton as well. My last major point, without actually trying to figure out the chemistry of these inks is the handling and final sale of the garment. Would a person buy these garments if they knew the details and contents were formaldehyde? Are these garments being sold without being washed? Like I said in my previous post, I can feel the burn. I think this explaination below says it all in describing the user as taking an allergy test while wearing this type of garment for the first time. If these garments are washed before being sold then that is the only way that I can accept these items to be passed on to the consumer. A tag is not a sufficient identification of the risk of having printed with these inks. Hazardous Material Information: Manufactured using the safest possible ingredients and represents no health hazard in normal use. Safety Considerations: The ZFS discharge agent recommended (ZINC FORMALDEHYDE SULFOXYLATE) is not toxic or hazardous but it should be handled as specified in the MSDS and direct contact, ingestion or inhalation of the dust or fumes should be avoided. Tagging Of Discharge Printed Garments: As the chemicals remaining in the print are highly water soluble they can be removed by rinsing the garment in warm water. It is because they are so soluble in water or perspiration that residual chemicals in an unwashed print might irritate the skin of sensitive people. In effect someone wearing an unwashed garment is preforming their own allergy test and a few are bound to test positive. For this reason and because the possible problem is easily eliminated by washing the garment in plain water we recommend that discharge printed garments be tagged " WASH IN WARM WATER PRIOR TO WEARING". feel my life slip awaaaaay, aaaawaaaaayyyyy...(music continues for 20 minutes). I've been here before and I think I am going through this process of testing inks to see if I end up at the same place I was 10 years ago. Discharge inks are exotic and toxic. There is an appeal to the non-ink ink, the missing link of screenprinting, the botox of fabric, but it is no less dangerous. I am yet to read the MSDS sheet of the inks I printed with today, but my skin was itchy, my throat was scratchy and I felt a slight amount of naseau that came and went. When I showed my wife the shirts I printed she said they made her eyes burn when I brought them into the room. I am very sensitive to chemicals and part of this may come from the fact that I have worked with everything from frying grease, bottom paint, kevlar, silicone, t-shirt inks and photo-chemicals to varying degrees over the years. When I open a container of poly-urethane I feel the burn. I know the taste and I feel lucky that I have made it to this point without falling over. Many of my friends have died from either brain cancer or liver disease and suspiciuously I must wonder if it was the chemicals that they were around. There is one advantage to being older and that is that I can feel my way through the bad stuff while experimenting like a blind mouse and I am most likely past the stage where the slower diseases can take root and knock me out. Most of the stuff I am now working with would take 20-30 years to kill me, so I can guess that something else should kill me first. I may as well try and experiment while I can and try to find something better for the printers to come. I sat through a Saturday seminar on discharge inks in 1990-1 and it was clear to me that I did not want to work with formaldihyde. Who would want to work with something that you are only supposed to have in your system when you are dead? This was a chemical used to discharge the dye in t-shirts. It sounded great, printing water-based on darks, but I knew I didn't have the equipment to properly vent the stuff and I decided I couldn't go forward with printing discharge at the time. Several times over the years it's come up and always the same result. There is an active ingredient necessary in discharge inks when in order to knock-out the dye in the inks. This is similar to a bleaching process, but the idea of discharge is that it won't destroy the fibers in the cotton. I used to work in boat yards and the rule was that the younger you were the more deadly the more toxic chemicals it was that you had to work with. It was explained to me as everyone can absorb a certain amount of these things and everyone else had already reached their limit. This meant that I was handed the gilded brush and can of toxic paint then directed to crawl into a 2-3 foot space while painting upside down on my back. I did my job then, but I learned that some things will kill you and you should limit the intake of these chemicals if possible. Discharge inks still seem like a bad idea to me for regular screen printers to be using. I'm going to experiment some more, maybe I can get over the thrill of seeing the ink change color under a flash unit which causes the fumes to seep out like the after-smoke from a bong. I like the feeling of the non-ink ink and the bone colored look on the shirts, but is it worth it. Plastisol isn't pretty and PVC's may be bad somewhere in the manufacturing process, but I don't want to smoke these other potentially caustic chemicals just to get a softer shirts. It is the misinformation about these materials that upsets me the most. I'm not a chemist and I'm not a hippy, but as a worker, a printer, I am going to try and give my customers what they want if I can. I don't want to try and change the guidelines for printers either, but I don't like the idea that the marketing of green products is infering that something is good because it looks and feels better on a shirt when it may be significantly worse for the people who have to print the shirts themselves. I am trying to reserve judgement until I completely understand the technical data on the inks I am experimenting with, but my body is an indicator of the toxicity of products too and I am not encouraged by water-based inks, discharge inks and dying type of inks as an environmentally-friendly solution for the screen-printing industry. 1- How do we get an account set up with you guys. You don't need an account. You can purchase shirts from our website if you need samples, unless you are in LA or SF, in which case you can visit one of our stores. The turnaround time is 2-3weeks on average, including shipping, depending on what part of the country you are in. Shirt design is too low of res. It has tons of shading in the grey area and is unprintable in it's current form. The tones need to be solid and the resolution better in order for us to be able to print your design. This design would also require a white layer to be printed on dark shirts. Here is a link to the printing and shirt prices in the meantime. If you need an estimate for artwork to fix this design it would be $200 and it would end up as a 3-color design. Question: hi, i'm making tshirts for my house and i just wanted to know how long it will take for an order of 25 tshirts with a front design to arrive? Answer: 2 weeks, from the time the artwork is approved and payment or a deposit is received. I have decided to follow the market with t-shirt prices more closely. I am attempting to pass these savings on to the customers by watching for sales and posting updates on my t-shirt pages of cheap t-shirts when they are available. I am going to apply a lower margin than I currently apply in order to sell more of these cheaper items. Shipping cost are a big issue and I may have to work out a generic formula, but it is impossible to exactly calculate shipping prices so that will be left up to my shopping cart. I have just worked out some Sale prices on Gildan Heavyweight and Gildan Ultra T-shirts which you can find here. Basically I've got the Gildan Heavyweight White t-shirts down to $1.50/ea and the Gildan Ultra down to $2.00/ea. Color tee shirts are an additional $1.00 for each style. Both of these styles are good quality and are available in a wide range of colors. They are a bit boxy from the fit standpoint and not super-soft, but you get what you pay for and these are completely acceptable for an affordable basic t-shirt. Tee shirt inks are essentially colored glue, plastisol is anyway. Other inks are basically stained and screen printing in general is controlled staining to the degree that it is plausible to control the inks. More control of the ink equals more detail. The issues of envrionmentally friendly inks is complex depending on which environment you are talking about. The waste product environment, the work environment and or the manufacturing environment. I've concluded that water-based inks are essentially not environementally friendly from the final waste of the printing standpoint, but they have significant appeal from the end-user and marketing standpoint. My argument is that the ink as a waste product in the work environment causes air pollution for the printer and water waste in the form of diluted ink that ends up in the drain. The final result also creates a shirt that should be washed, an additional step, before being sent to the consumer, which also increases the cost. However, the appeal of this type of garment may allow for those cost to be absorbed by the consumer if that's what they really want whether it is environmentally friendly or not. To reach a final conclusion though I have tried to find out what is in water-based inks and it seems to be that a resin-polymer makes up the actual color that is suspended in a geletan paste-like liquid which we refer to as INK. My initial attempts have been to attempt to mix a food-grade ink/glue and those failed in the wash test, so I went to a craft dye supplies store, Dharma Trading, and purchased several items to continue my test. My next attempt was to compare dyes to inks and this is technically interesting and the final solution lies within, but I don't have the answer yet. I do however have a new assumption that if it is correct would allow me to drop my contention that water-based inks are bad for the waste-environment. A dye is diluted into a liquid and permeates the cellulose structure of the host material and makes a chemical bond with the fabric. Once this chemical process is complete then the active ingredients in the dyes, which may be potential pollutants, are spent suggesting that they are inert for contamination purposes. The final wash which removes the excess dyes from fabrics then completely neutralizes the spent chemicals still in the garment and washes out inert diluted liquids into the drain. As this appears to be a chemical process the completion of the dilution renders the chemicals that are mixing with water as inert and therefore drain-safe. T-shirt printing isn't dying, but this helped me understand the difference between dyes and acrylic water-based inks and in the end plastisol inks. A water based ink is not a dye although it is sold on the market like a dye and it for all intensive purposes it looks and feels like a dye on the shirt. A dye is a chemical reaction and a water-based ink is a stain that is saturated and fixed onto the material because the chemical nature of the acrylic ink is a poly-resin coloring that mixes with water and can permeate the fabric, but it does not dye the fabric. There is not chemical reaction other than drying and once dried then then acrylic inks may become inert, but the dilution of the inks in cleaning would continue to dilute and disperse the acrylic coloring. The environmentally friendly issue then with water-based acrylic inks is the underlying resin-polymer and I don't have a clue what that is made of. If these colorings, which are not dies, are drain-safe and dilutable in the public water system then I would drop my position about these inks. The manufacturing of these can then be compared to the manufacturing of plastisol inks and/or dyes. Experiment: I mixed a batch of seaweed paste by following the instructions provided in the Dharma Trading catalogue. After letting it sit overnight it was very similar in color and consistency to the honey I was previously using as a base. The difference this time was that I was going to mix clothing dyes into the base instead of food-grade dyes. The dyes were in a powder form and therefore the inhalation of them is one potential hazard that is easily remedied with a mask. The pot life issue of the seaweed paste is also an issue, so I mixed enough to use as needed with the various dyes. Since the paste is a water-based mixture the chemical dying reaction begins once the color is mixed into the seaweed paste and that starts the activation process. I printed a once-color random design on a white shirt with a bright red dye paste and it was clear, easy to handle and the lines were well-defined through a 125line screen. I washed out the remainder of the ink and it was globular and diluted in the waste water. The technical assumption here is that it will be spent before it moves through the drain system and within 3-6 hours it should be completely spent / inert. My attention was then drawn to the labels on the dyes and there were clear references to Proposition 65 and the fact that these dyes contain ingredients known to cause cancer. My assumption is that the cancer causing substances are in the air during mixing and in the diluted mixture up until the point where the chemicals in the dye are spent, otherwise these chemicals shouldn't be used as washable and/or drain-safe. Finally, the detergents in a final wash may indeed make these chemicals inert, which is why I conclude that final wash would be necessary before passing these types of products on to the consumer. How does this compare to the acrylic polymers? Technically I don't know. If the acrylic polymers are harmful or not when they are in the liquid/printing state then they may not be harmful in the drain or as they are further diluted. I didn't see any references to cancer causing ingredients in the water-based acrylic inks that I purchased for testing. There are references to these types of substances in the "drying agents" which I call "Activators" that can speed up the drying time and fixing of water-based inks. Also the manufacturing of these inks may have the same underlying problem of the plastic industry to make the acrylics. The ink / coloring has to come from somewhere or something but I need to do more research on this. I did several samples also using discharge inks and combining the Seaweed Dye Paste and Water-based Acrylic Inks to varying degrees of success. In the end the purchased Water-based Acrylic Inks had a better hand, look and feel, than the more washed out effect of the Dye Paste. I was able to mix the Acrylics with the Seaweed base and even got the Dye Paste to print on Dark garments. I could see doing further test with the Seaweed Dye Paste as an inexpensive base to extend the Acrylic Inks. After washing there was no difference in the feeling of the dyes and the inks. The chemical used for the dischare will require more research too. My big question is whether or not the Water-based Acrylic Inks are releasing toxins in the air while drying or down the drain during washing and dilution. If screens are used once and inks are not rinsed through cleaning then the Water-based Acrylic inks would eventually be dried and a solid, but the cost of processing screens and handling t-shirt jobs significantly increases as a result. None of the inks survived the most basic of wash test within a 24 hour period. The good news is that they are safe to wash-out of t-shirts. I'm going to dig out my old Water-based ink selection and check out Dharma Trading for the Speedball water based inks to see if the labels read drain-safe. Back when I used water-based inks for all of my printing the shirts required an activator, which was a carcinogen, to be mixed into the different colors. This chemical was like a fixer and it reduced the pot life of the inks, but it allowed them to be washed sooner versus later. Also I spent as much time hanging shirts on clothes lines as I did printing, so I'm not looking forward to going back in that direction. 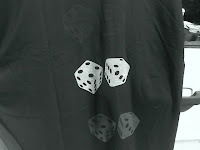 Opacity on darks is also a big issue, but by mixing clorox substances to knock out the dye in shirts so they can be printed with water-based must reduce the strength of the cotton and in and of itself should force the manufacturer to wash the garments before they are offered for sale. Otherwise the garments would have remnants of these chemicals in the shirt when the shirt is sold to the consumer. A warning tag should also be placed on the garments if they are not washed before being sold. I like the feeling of the soft prints, but the additional cost and risk associated with the handling isn't a pretty picture. The other issue is to mix large amounts of Soft-Hand into the pigments for reducing the thickness of plastisol. This only solves the softness problem, not the reduction of PVCs in inks problem. I mentioned the pasty nature of the drain-safe ink I was mixing earlier so many times that I decided to go find some paste and mix pigments into that. It wasn't easy to find paste these days, so I mixed food coloring with glue and flour. It worked. I didn't like the pastel coloring that the flour added, but I was able to squeeze it through the screen with my "2X4 squeegee"(TM) and I left the shirt out to dry. The idea here is that glue has the consistency of the types of inks that I use for screen printing. Also glue claims to be Non-toxic and Safe since it is most commonly consumed by children as a dietary suppliment and is most likely more nutritous than the foods available in the free-food program (if they still have that). We'll see how this washes tomorrow. I remember a Borden product for coating decks that was supposedly made of biodegradable/milk products. Basically water-based carriers like honey and glue mix well with food dyes and oil based greasy products don't unless they are diluted first. However the oil based products withstand drying while stored in a concentrated environment like a bowl and therefore have a long shelf life. The goal here is to maximize pot-life and maintain a thick viscosity with bright pigments in a bio-degradable mixture. The problem is that the pot-life and drying potential are opposite effects. Which explains the popularity of plastisol inks since they have an almost eternal pot-life and controllable drying time with heat, as well as, a bullet-proof opacity if necessary. I can't help but seeem to want to combine two topics in each title. Maybe it is because I like distractions more than I like the real projects that I have to do and by having dueling topics I can keep my writing as incidental as possible. Tattoos. Yes, this is obvious. T-shirt imagery is very similar to tattoos. This may be why I don't have many tattoos, but I do have a lot of shirt. I've been noticing this more as prints are showing up in a wider range of locations and in more subtle forms, this is indicative of the less obvious tattoo art. I am going to start posting the responses that I have to email in this blog so that it can help people with questions. Maybe once I get enough answers it will be easier to format an FAQ. Also this will make me take more care in my answers since they will end up being published. The goal is to stop answering the same questions over and over again. My maximum print size is 10.5" X 12" approx. for the standard print pricing. We don't do all over printing at this time. This order will require 2 color changes (We want the print in a total of 3 colors). Yes, that would be 2 color changes and each color change in the middle of a print run is $20 per color, as long as the artwork does not change. Im looking at getting around 20 t shirts printed, just wanting to know what size/ or restrictions there are with the actual design - how big is the area on the front of the t shirts that gets printed? Also - with the one colour print, can that be any colour choice? - do I just specify the colour i would like when placing the order with the graphics. One more question, sorry! How long would it take to process an order for 15-20 shirts with a one colour print? The setup cost for a one-color job is $30 for the screen. The maximum print area is 10.5" wide X 12" high. You can choose the ink color for your shirts. specify the color when you email the design. typical turnaround is 10-14 days. I was looking for a better G-word like, God, Guns and Greed, but since I am working with Honey today this works best. Continuing the research for a food-grade ink I mixed pigment with Honey, Crisco and Coconut Oil, not finding any Soy based oil in the store I was in. The consistency of the Honey was pretty good, but I through in a little Olive Oil and viniger to take away some of the stickiness. The pigments didn't mix well with the crisco and the Coconut Oil will just have to be used for Pina Coladas. Then I went back and put the Honey mixture with some Crisco and got a sort of paste that resembled screen printing t-shirt inks. After doing a sample using an old screen and a block of wood as a squeegee I've gotten some red splooges onto a shirt. I'm currently drying the shirt in the sun, because I think it would be best to see if the inks dry on their own, then I'll put it through a wash test and try not to eat it before it is done. Step one is done, yes this "Ink" would be drain-safe in it's current form although it may need to stay refrigerated once you open a container. Nobody really wants to talk about this stuff. Not my over-burdened wife. Not my game-playing kids. Not my tv-watching daughter. Not my unaffected friends, if I had any. Not my accountant, gardener or any one else with half a life. This is why I have this board. To think aloud in text. I've been trying to work my t-shirt interface into an ideal shopping cart, but it doesn't exist. There are several functional carts out there, like Yahoo, or OS Commerce, but nothing really can solve all the problems that need to be solved with the myriad of choices, shipping methods and compatible payment methods that are required to stay in business on the internet. The worst problem is that the more compatible that a cart is the more it attracts fraudulent customers. This creates a vicious cycle of ridiculous orders that need to constantly be reviewed and it just stalls the entire system. I am considering the worst possible scenario, which would be to provide a link for three different shopping cart options on each product. There problem here is that the code for each product in each cart will conflict. W/E. Meta Tags and the perfect html are killing me. I've worked hard to create some pages that are compatible with html 4.0 and that will provide a clean read to spiders for indexing purposes. However all the scripts that run shopping carts or provide any creative web functions send these compatibility issues into chaos. Clean html seems impossible. Every site that I try and confirm the html in this type of system fails, so I should just give up trying to make the html work for the this type of script. Lastly, I've had successful t-shirt message boards/forums in the past but my current ones are always being over-run by spammers. I don't have time to keep deleting post to keep the boards clean. I just like to start a contest and come back in a couple of days, like fishing, and see if there are any good designs. I don't mind answering questions, but I hate spending all of my time deleting spam so the board can stay operational. The more I block the spammers then the harder it becomes for the average user to make a post to the boards because they need to sign up and such. 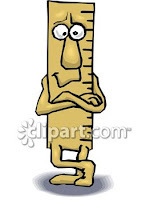 It's a shame that this resource has been hijacked by wasteful postings that must be automated postings. Sure if I just did one thing, ran a message board, then I could pull it off, but I've got too many other silly projects going on right now. Like perfecting the perfect ink made of bee honey. I was discussing this with a friend of mine who is a proponent of Soy based inks. Neither of us has found a t-shirt ink in production that is truly non-toxic and just because an ink is water-based that doesn't make it non-toxic. It may be PVC free, but the pigments and such often end up in the drain when printers use water-based inks for t-shirt printing. 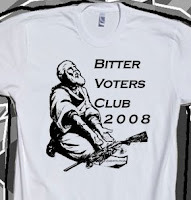 - Go here to order the Bitter Voters Club t-shirts. Or click here to print your own Bitter Voters Club Flyer. I was tearing out some insulation and found a hive of bees the other day. Needless to say I was scared at the initial discovery and waved my hands frantically while squealing and running in circles. As I calmed down and removed the pink cushion a hive fell out. First we put the hive in a jar with a couple of bees and stared through the glass. The next day at the scene of the crime many bees continued to come back to the area. Then a small girl from across the street saw another part of the hive on the ground. I collected that part of the hive and put it in a plastic container and combined the original larger hive with it. The container had two openings and I placed it in the same location and watched as the bees started returning to their hive even though it was inside the plastic container. I've since moved the container around the yard and have given it a home inside an igloo-type dog house so that I can watch if it grows or dissolves. My wife isn't so excited at the prospect of naming the bees and having them as pets, but I think it's fun and educational. Tonight I watched an entire episode of Animal Planet on Killer Bees and I'm becoming more intriqued with the concept of keeping bees and hoping that they don't rise up and kill me as their tyrant owner. The leader of the bees is appropriately named Bubble, but I think I will have to be more creative in the future or they bees won't respect my naming powers. I can't help but think of the episode of SpongeBob when Mr. Crabs was squeezing the jelly from the Jellyfish for the special sauce in his Crabby Patties. Do Bees have a special Honey that I can use to make an Organic non-toxic screen printing ink from? Was this the divine intervention that I have been waiting for? Or am I simply an incidental temporary housing project for this superior beings? The Bees are also clammering about as a result of Obama's "Bitter" comments. I'm quite proud that North Carolina is in the news for people posting "I'm Bitter" bumper stickers on their vehicles. I think of North Carolina as a radical mix of American culture and having been raised there during my teen years I now recognize the political nexus that it is. Many people love the state, but it isn't easy to understand the intricacies of the people. I'm not even sure if the "I'm Bitter" bumper stickers are pro or con about OBama, which makes them very similar to my own designs. I'll make a design mostly because it touches on an issue versus because it takes a side. At first glance, however, many of the designs appear to take a side when they may be very ambiguous. I'm bitter about this too. Today was the first day that I agreed with the verbatim words of a political leader and felt an impact from the proposed policy as being relevant to our times and culture. John McCain announced that he would propose to suspend the gas tax during the summer. Why? I feel that the government profits from the increase in gas and oil revenue increases and therefore is in a position to stay quiet on the matter. I also feel that directly giving money to the population of a state is downright stupid. I could provide more details on these two points, but I don't want to bore you any more than you already are. The policy of removing the revenue generating source of our inflation creating commodity by reducing the governments take is a logical suggestion and it approaches the problem from an angle that I had considered untouchable by elected officials. John McCain is not currently elected, which is why this may be fair game as a talking point and the idea of a Hundred Year War for Oil is out of line. However, the fact that he has hit the nail on the head on one of the ways that the government is able to enjoy higher gas prices while we pay through the nose has given me the respect for his logic that I had otherwise lost for our potential leaders based on their ability to miss the point 99.9% of the time. The Bad: I found out that after 2 years of paying several leases from Dell computer for a few items I was ultimately scammed by the over-evaluation of the prices so that buying the product outright is unreasonable. Plus if I don't want to keep the computers I have to pay to have it shipped back. The real problem is that I've got several more leases and even purchased longterm insurance contracts for the systems so that if they broke I'd be covered. Talk about wasting money. The Ugly: A review on Yelp that stunk. Sure it doesn't really matter much, but it hurts. I just put a Yelp sticker on the LA store window. You can't please everyone anway. I'm going to take a break from posting for a few days as I want to go back and edit my prior post to remove any errors. Although I like sporadic and quick postings I can't really justify leaving unedited post with tons of errors while my kids are learning proper grammer in grade school. I wouldn't be a good example if I didn't fix my own mistakes on this blog.